I was wondering what Goodman Games has planned for character sheets? Just a thought. You could offer another more printer friendly one too of course. I think they might look rather cool. Latest games: DCC RPG of course! 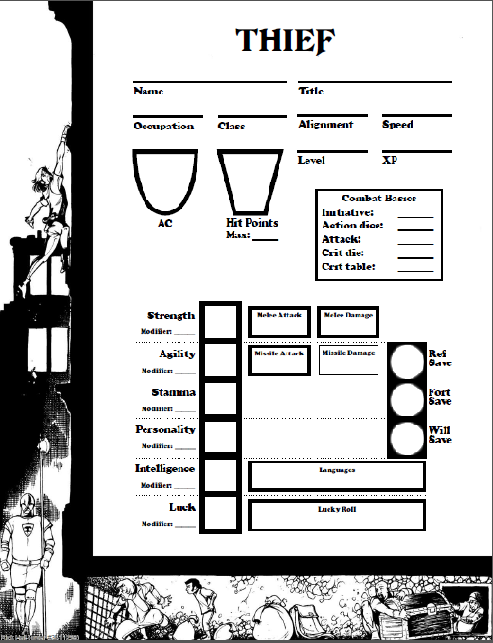 Now that you mention it... Are the official character sheets (like the ones in the beta pdf) available online somewhere? I knew I forgot something! Thanks for the reminder. Use the link below for now, and I will get this linked to the main site. These are still the beta sheets, wih the percent thief skills and older cleric lay on hand rules. Just a friendly note! Thanks for the catch -- just re-uploaded with the "plus" version of the thief sheet. Same link should get you there. There may be some other legacy playtest items on there, now that I think about it - if anyone sees any other "playtest-isms," let me know. Something like this (but better, and as an actual pdf)? EDIT: Derp, just saw you specified "landscape"..
No , I like that as portrait style a lot! Bravo! If people want landscape I guess they could just print 2 pages per sheet. I was going to make some but was worried Joseph might not like us ripping the artwork. This game is awesome! Best version of D&D EVER! if anyone sees any other "playtest-isms," let me know. The Cleric sheet only goes to "Level 3" for spells. Thanks for the heads up on the cleric spells - headers updated; same link will work with the new file. We will definitely get some illuminated character sheets going at some point! Wow! That's quick fixin, sir! Thanks much. Well, I rolled my very first ever DCC Rpg character tonight! Here is a .jpg of the index cards I made. Just print them 4 per page, cut 'em out and laminate. Don't know if these are any use to some of you but I think it'll save on time and paper for the 'funnel'. These are so cool. And the lamination is brilliant. They're great! Personally I do the stock ones, 4 to a page, and cut them out. I have a nice stack of 0-level characters... dead ones. We went through a lot for a while... I do have to say, laminating them is much better for the environment! I am really getting interested in this game. Enough to register here and start thinking about how to find local players (haven't played a tabletop RPG since 2E). 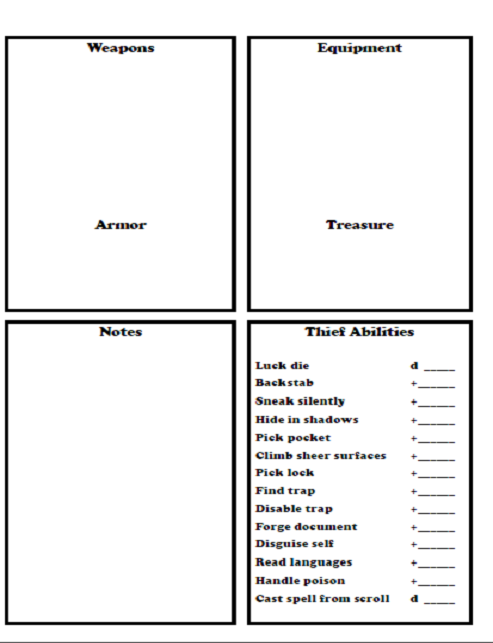 I like the character sheet examples shown in this thread, but for me it just doesn't feel like old school gaming unless your character is hand-written on binder paper. Ahhhh, man, that brings back memories. Good stuff. Well played, sir. That's a pretty awesome first post. Wrote them all out by hand slaved over them with tender loving care. Giant bolder trap in the first corridor......splat. I was left with one character and a lot of mess. That was my first and only experience of 'the funnel' that is prompted my laminate cards!